Papua New Guineae Chief Customs Commissioner is warning people to refrain from smoking foreign cigarettes. Ray Paul, says foreign cigarettes including BRUS and Double Happiness cigarette brands are smuggled items, which evade paying tax by falsely declaring them on their consignment. 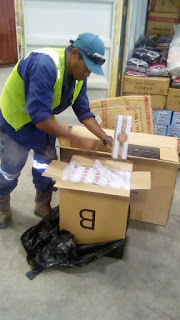 The cigarettes are sold at 50t per stick on the streets of Port Moresby. "Its important that everybody that comes to do business in Papua New Guinea, please respect the laws of this country. "Nao ol manmeri wea yupla continue lo salim disla Double Happiness lo street ah, harim gut, disla em ino gutpla smoke. "From reliable sources that we've heard is that these smokes were not manufactured well. They went on to identify some dirt in it which causes sickness for the smoker. "So the people in Moresby, the people in southern region or anywhere across the country, you can always help yourself by not buying Double Happiness smoke because they've also not been declaring according to Customs."